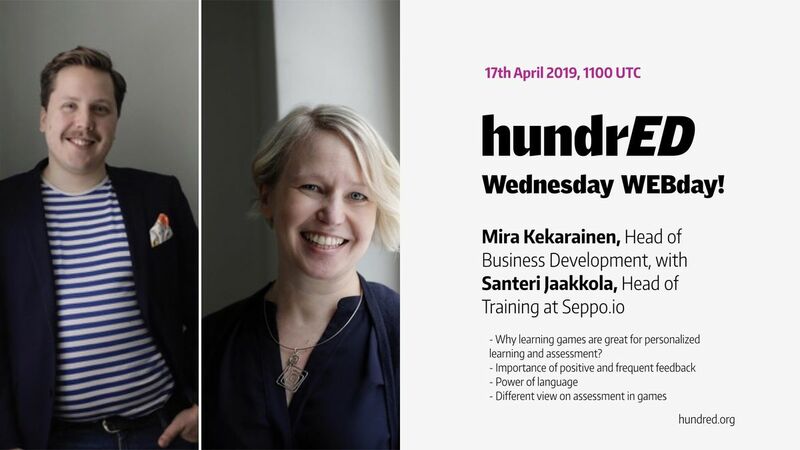 Join Mira Kekarainen & Santeri Jaakkola, from SEPPO (Finland), recognized in the HundrED 2019 collection, as they go live on the HundrED Facebook Page to share why games are great for personalized learning and assessment. Where and when is the webinar? Wednesday WEBdays are via Facebook Live and we invite everyone to actively participate in the conversation! You can access the Webinar by joining the HundrED Facebook page. Join the conversation on Wednesday, April 17, 2019, at 11:00 (UTC). Who are Mira Kekarainen & Santeri Jaakkola ? Mira Kekarainen is Head of Business Development at Seppo.io. She has a master’s degree in Marketing and Business from Aalto University, Helsinki, and a degree in Solution Focused Coaching from Helsinki University +. Mira grew up singing and playing music as part of her basic and upper secondary education, and music and arts have affected her view of the world. Mira is also a mom of two kids. Having a kid with learning challenges has taught Mira a lot about the importance of finding ways to support all types of learners. Mira has worked in many different fields during her career, but with the solution-focused approach, she has found a passion for positive psychology within education. She believes that every child can flourish and learn when given the possibility to use their strengths and receiving the right kind of encouragement. In her spare time, Mira does different sports, sings in a choir and spends time with her kids. Santeri Jaakkola is Head of Training at Seppo.io. Santeri studied speech and communication teaching at Helsinki University. He also trains and tutors presentation and interaction skills. Santeri’s background is in arts, and as part of his upper secondary education, he studied theatre acting and rhetoric. All this has helped him to be able to understand the different set of needs different learners have and give support in an individual level. Santeri loves playing games and cooking. He also volunteers in art related projects. HundrED WEBdays take place weekly via Facebook Live and we invite everyone to actively participate in the conversation! You can access the webinars by joining the HundrED Facebook page. Contact our Head of Community, Pukhraj Ranjan, for more information: pukhraj@hundred.org.